Once largely focused on fusion-energy research, the center now also brings researchers developing renewable-energy and energy storage technologies together with engineers from outside the university who can test and implement their ideas on a large scale. Join leading scientists, engineers, students and key stakeholders from the energy, policy and social science communities April 20 from 8 am to 3 pm at Atkinson Hall to discuss the Center for Energy Research's key research areas and the challenges we face to sustainably meet the world's growing energy needs. Speakers will include a range of academic and industry leaders, and a poster session will provide valuable networking opportunities with students, postdocs, faculty and industry representatives. Those partnerships, often financed by grants from California Energy Commission, the state agency charged with reducing energy costs and the environmental impacts of power generation, are allowing the center’s researchers to help local facilities, such as the Port of San Diego and the Miramar Marine Corps Air Station, become more energy self-sufficient and to cut carbon emissions. “Our long-term goal is to help make the San Diego region a world leader in demonstrating how public and private entities can cut energy costs and greenhouse gas emissions through renewable-energy and more energy-efficient technologies,” said Gary Matthews, Vice Chancellor for Resource Management and Planning. The partnerships not only allow the university to extend a helping hand to the rest of the San Diego region, but also provide the center’s researchers with practical feedback on how their inventions and innovations will actually fare in the real world. Most people don’t realize it, but an innovative “microgrid” provides 85 percent of the electricity for the more than 50,000 people on campus during a typical work day, as well as 95 percent of their cooling and heating needs. Composed of two 13.5 megawatt gas turbines, a 3 megawatt steam turbine, a 2.8 megawatt fuel cell, a 2.5 megawatt battery energy storage system, 7 million gallons of thermal energy storage, and a 1.2 megawatt photovoltaic installation, the campus microgrid draws utility grid energy from clean sources such as wind and solar power. That has made it a key power player in the campus’ long-term sustainability efforts to achieve carbon neutrality by 2025, when all of UC San Diego’s electricity is expected to come from renewable sources. 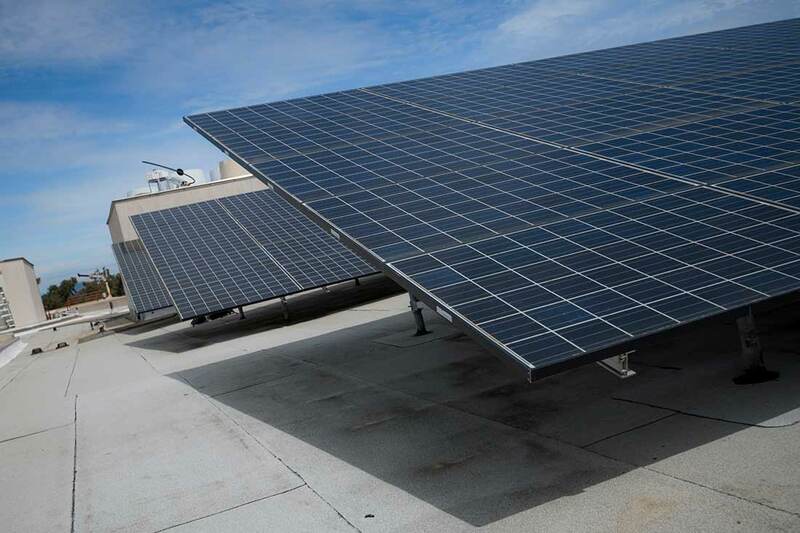 Solar panels on buildings will help the campus achieve carbon neutrality by 2025, when all of UC San Diego’s electricity is expected to come from renewable sources. In addition to saving the university more than $8 million a year in energy costs, the microgrid enables the campus to operate independently from the local power grid in an emergency, providing security for research and health care facilities in the event of regional power blackouts. 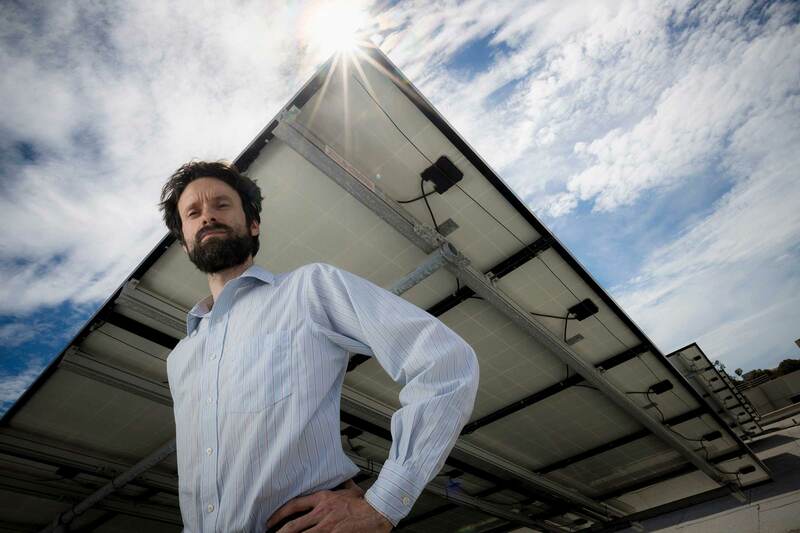 Washom’s and Matthews’ leadership in developing the microgrid, one of the largest at any university, has made UC San Diego a leader in distributed energy technologies. A $5 million grant to help the Miramar Air Station develop a “microgrid,” a power grid similar to that on the UC San Diego campus. Miramar’s new renewable-based microgrid is expected to provide over 75 percent of the Marine station’s electricity needs by 2020 and will not only reduce fossil-fuel use and greenhouse emissions, but serve as a model for the development of other self-sustaining military bases of the future. A $5 million grant to the Port of San Diego to develop a permanent, renewable-energy-based microgrid at its Tenth Avenue Marine Terminal that can replicated at other seaport terminals throughout the state. It will consist of a 700 kilowatt solar panel array, lithium ion battery energy storage and energy management system. In addition, the terminal’s high-pressure sodium lights, which now consume 33 percent of the terminal’s energy, will be converted to energy-saving LED lights, to reduce by 60 percent the energy used for lighting. A $4.2 million grant to help Nuvve Corp., a San Diego-based company, test new technologies that will eventually allow parked electric vehicles to become part of an electric grid. Nuvve is deploying its “Vehicle to Grid” charging platforms on 50 new UC San Diego electric vehicle chargers and the campus plans to expand that number to 150 by the end of the year. A $5 million grant to collaborate with Cleantech San Diego on the San Diego Regional Energy Innovation Network, which provides access to the resources and facilities of a number of regional partner organizations and connections with industry to accelerate the commercialization of emerging energy technologies. A $1.5 million grant to assist the disadvantaged community of Encanto to become an Advanced Energy Community. Kleissl and other energy-center researchers, working with engineers from Nuvve, will be testing several concepts using the campus microgrid that concern the timing of when to charge electric vehicles and how best to use their power in an electrical grid. Plugging parked electric cars into an electric grid can allow it to draw power from the cars during peak-use hours, when electricity is not only in short supply, but expensive. And as electric vehicles become more commonplace, power companies will need to figure out how to avoid overloading electrical transformers in residential and work settings. “The loads from electrical vehicles are so large on a house that if four neighbors are charging their vehicles are on the same transformer, this will overload the transformer,” said Kleissl. 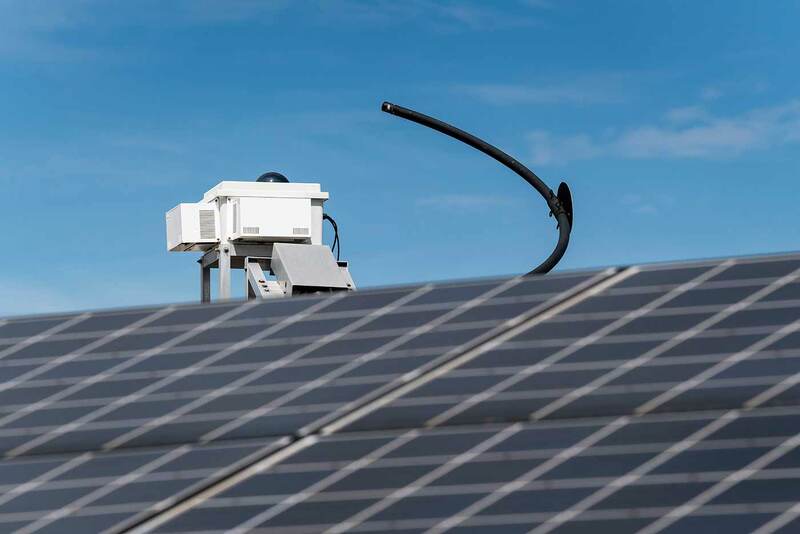 The “sky imager” seen above the solar panels can provide better advance forecasts of the solar energy that will be generated at a particular time on a partly cloudy or sunny day. Another concept that Kleissl hopes to test is a device called a “sky imager” that he developed and installed on the roof of the building in which he works at the Jacobs School of Engineering to provide better advance forecasts of the solar energy that will be generated at a particular time on a partly cloudy or sunny day. “Whenever you operate a microgrid, you go from passive to active in order to control the timing of when you produce and consume electricity,” Kleissl said. Current methods of solar forecasting depend largely on satellite data and local weather forecasts, he added, but improvements in forecasts for solar and wind energy production in California alone could save energy markets an estimated hundreds of millions of dollars a year. By capturing images of cloud cover with his sky imager before they affect solar panels, Kleissl is able to gain about 10 minutes of advance warning of the power output from solar panels. How much could that save a power grid by giving it advance warning to dial up or down its power use? Kleissl doesn’t know, but hopes a future collaboration will provide him with real-world data.